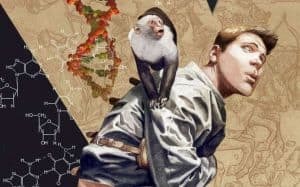 Y: The Last Man TV Series Nails Down its Showrunner | Nerd Much? The Y: The Last Man TV series is finally making some progress. While the project was announced awhile ago, they just now announced a showrunner. In a report from The Hollywood Reporter, Michael Green will act as showrunner for the upcoming FX series. The script will be co-written by both Green and Brian K. Vaughan, the creator of the comic book series. Y: The Last Man centers around Yorick Brown and his pet monkey. In this dystopian sci-fi story, they find out they are the last male mammals on Earth. Even if you aren’t a comic buff, this is one everyone should check out. Originally, the series was going to be brought to the big screen. After a few iterations of scripts, the rights went back to the creators. Eventually, FX picked it up for a television series. In addition to the Y: The Last Man TV series, Green works as a writer for several upcoming projects including American Gods, Logan , Blade Runner 2049, and Murder on the Orient Express. We honestly feel that Y: The Last Man could be as big as The Walking Dead. FX probably hopes for the same. With direct creator input and a great showrunner, we are keeping our eye on this one.